1. Adjust the oven rack to upper-middle position, place a rimmed baking sheet on rack, and heat oven to 450 degrees. 2. Meanwhile, toss potatoes, cornstarch, salt and pepper together in a large bowl. Carefully remove preheated baking sheet from oven, add oil, and tilt baking sheet to evenly coat with oil. Place potatoes, cut side down in single layer, on baking sheet. Roast until browned around the edges, about 30 minutes. 3. 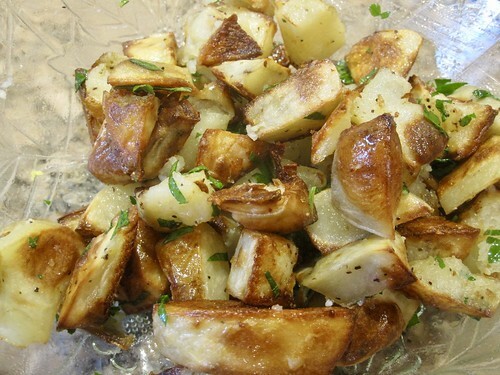 While potatoes roast, mix butter, garlic, parsley and lemon zest together in a medium bowl. Remove baking sheet from oven and, using a metal spatula, turn potatoes skin side down. Roast until potatoes are crisp and deep golden brown, 10 minutes more. 4. Transfer potatoes to bowl with the butter and toss until evenly coated. Season with additional salt and pepper.